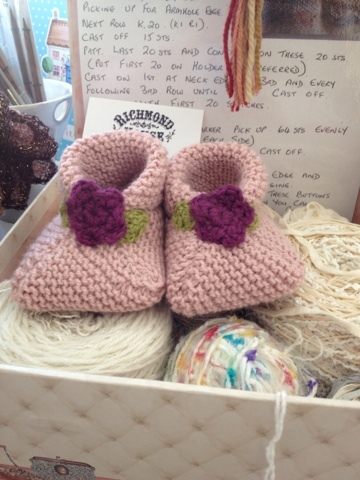 These little booties are made up of six squares of garter stitch, sown together. It is surprising how time consuming they turned out to be. Finished them off today shouldn't babysitting the wool shop. Bridport is soooo hot, still, shouldn't complain, crazy to think just over two weeks ago we had the most awful floods and landslides. Oh these are soooooo adorable!! Ohh' Wish' you did these in big girl sizes..hehe! They are adorable and I love babies dressed in knits! Found you through LBF above and love that you knit for a wool shop, how fab is that. Have a lovely Autumnal weekend.